Obama at Selma on Ferguson: What happened is sanctioned by law and custom. The one thing Obama got wrong in Selma. 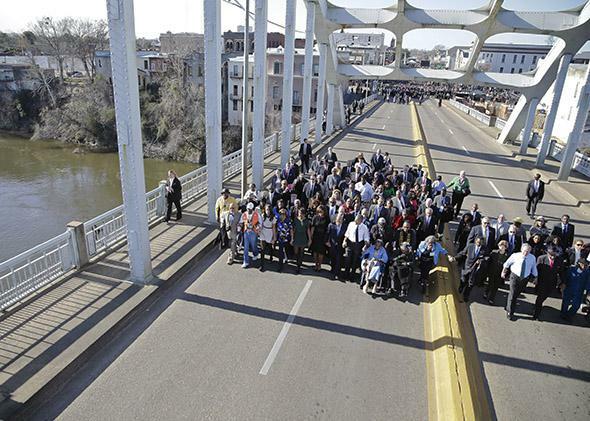 President Barack Obama and his family, members of Congress, and civil rights leaders make a symbolic walk across the Edmund Pettus Bridge on March 7, 2015, in Selma, Alabama. En route to his Selma, Alabama, speech on Saturday, President Obama told Grantland’s Rembert Browne that he doesn’t want to look as if he’s “putting the thumbs on the scale” when a big civil rights case is ongoing. Indeed, in the wake of the deaths of Trayvon Martin and Michael Brown, the president has been careful to not cast judgment when an investigation, state or federal, is still underway. In letting the legal process run its course, he’s simply being mindful of his “formal role,” he said. That’s all well and good. But during his rousing Selma speech, there were no longer any investigations pending. The Ferguson, Missouri, probe had concluded, as had the probe into Martin’s death. The time was ripe for some commentary on how he really felt about the facts and the law of these cases, or maybe for a constitutional critique. If there’s one takeaway from Ferguson—and the takeaways are legion—it is that the law is stacked against ordinary citizens. That police are largely shielded from liability when a life is taken. That the Supreme Court has a tendency to give law enforcement the benefit of the doubt. That prosecutors can use and abuse the grand jury process to fit their needs. That the bar for bringing a civil rights prosecution against a cop is almost insurmountable. That constitutional rights, in the face of state violence and oppression, are anything but enforceable. Ferguson has inspired a new civil rights movement, and one of its legal underpinnings is how little constitutional rights matter compared with the influence of the police state. The Ferguson report left no doubt about it. Abuses of the Constitution were all over it: unjustified stops and searches, and use of force in violation of the Fourth Amendment; the silencing of protected speech in violation of the First Amendment; discriminatory policing in violation of the 14th Amendment. The police department now faces the task of undergoing deep reforms to avoid future civil rights wrongs. But past wrongs remain, and any meaningful vindication will only be prospective. 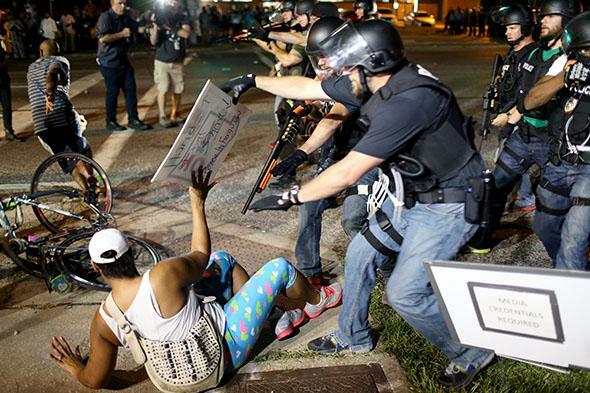 Police officers arrest a demonstrator on Aug.18, 2014, in Ferguson, Missouri. The endemic problem Obama disavowed doesn’t begin and end in Ferguson. A rampant distortion of a constitutional principle is part of what led New Yorkers to choose Bill de Blasio as their new mayor. Stop-and-frisk has been the law of the land since the Supreme Court approved it in 1968, but city residents grew weary of its discriminatory application, which the NYPD abused as a matter of policy to flout the civil rights of blacks and Latinos, all in the name of public safety. When a federal judge finally ruled against the practice in 2013, the moment was a culmination of years of organizing and action—a front that included protests, litigation, and lobbying lawmakers to enact NYPD reforms. The change was led by citizens uniting around a policy that was stacked against them. The same is true of other civil rights battles waged across America. Some are private, like the civil rights lawsuit the family of Tamir Rice filed against the city of Cleveland—thousands of similar actions are filed in federal courts across the country every year. Others are systemic, like the dozens of federally enforceable consent decrees the Department of Justice has forced on unruly police departments. Or they can be group efforts, like a New York City class action accusing the NYPD of implementing a quota system that led to the issuance of more than 700,000 dubious summonses. Even Ferguson residents are now seeking classwide relief in federal court for a “debtor’s prison” scheme that falls hardest on the city’s poorest. But there are other pervasive forces, deeply rooted in law and policy, that have dealt a blow to minorities. The failed drug war. Mandatory minimum sentences. The rise of the carceral state. The criminalization of immigration. Overzealous prosecution of petty offenses. Barriers to re-entry for those formerly incarcerated. The list goes on. Many of these are in the books, the product of democratic deliberation and lawmaking. Others are benign policies and customs—not explicitly discriminatory on their faces, but malignant for their untold effects on communities of color. President Obama is correct that none of these struggles are like the Jim Crow regime that motivated the civil rights movement of old. He’s even entitled to say that “what happens in Ferguson is not typical,” as he told college students during a town hall on Friday, a day before the Selma anniversary march. But to say that the law and customs have nothing to do with the new wave of protests and civil rights discontent belies the reality: that we still have to work hard to vindicate our constitutional rights. That the scales of justice are tipped as a matter of law.